On today's blog post, I will be reviewing one of the most recent films to hit theatres for the summer season. 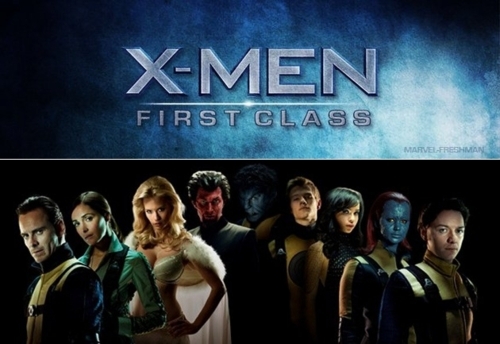 It's the action-packed prequel to the massively successful comic book adaption to the big screen: X-Men: First Class. The Premise: In a time dated piece set in the past, a looming threat is brewing with the possible emergence of World War III. Sebastian Shaw (Kevin Bacon), leader of the Hellfire Club, is manipulating the US and Russian governments with his allies of "visionary" mutants to engage in war and lead to his ultimate plan of the world being run by mutants. 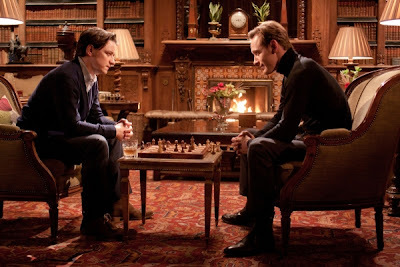 Created in an alliance with the US government, Charles Xavier (James McAvoy) and Erik Lehnsherr (Michael Fassbender) are recruiting mutants of their own to help bring down this opposing force before the world is plunged in a battle of epic proportions that could leave millions dead! 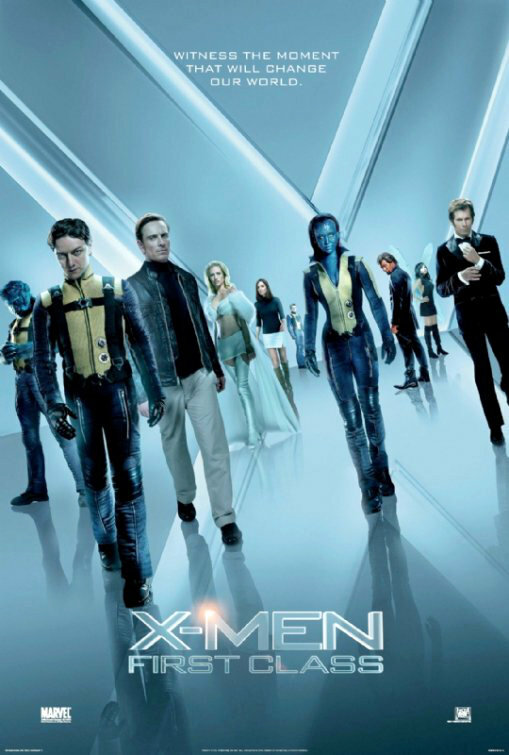 Set in a battle of good vs evil, the movie features a variety of mutants that fight for either peace or supremacy. On the Hellfire Club's side, there's Shaw, Frost, Angel, Azazel and Riptide (Alex Gonzalez) while on the X-Men's side there is Charles Xavier, Magneto, Mystique, Havok, Beast, Banshee (Caleb Landry Jones) and Darwin (Edi Gathegi). Dr. Moira MacTaggert is the only human to be an honorary member on the X-Men's side who fights alongside Professor X. The Good: Being a movie adaption of a series that is so beloved and has a long history with fans throughout the years, I really enjoyed that the story was executed quite well. Some scripts and productions like to loosely base movies off a single idea or theme from the original piece of material (i.e., the first Resident Evil movie or Alone in the Dark....I actually liked the former than the latter from those two movies) but I was happy that the personality of characters and their representation was almost done similar to the original; fans can only hope for "almost" when dealing with adaptations. Another aspect that is amazing in this film is the acting and the characters. Sometimes the acting is sub-par or melodramatic but it was a pleasant surprise. 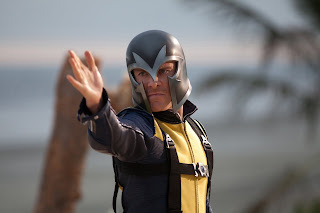 My top favourites based on the acting and their amazing performances have to be Magneto, Emma Frost, Professor X and Mystique. I'm familiar with the X-Men series when I was a child and never purchased/read any of the comic books but have an understanding with the history of certain characters, I preferred seeing this presentation of the pre-history compared to the Wolverine movie (not even going to talk about that movie....fine! It was good, not great but isn't my top film from the previous movies). It was great to see more character development of Mystique in this film. In the previous films, she was very mysterious and quiet but here she had some heart and I loved her even more. Emma Frost...all I can say is I love sarcastic and icy villains. The Bad: There weren't many things that were wrong with the movie; a lot of it was done well. The first thing I didn't like was the death of Darwin. I found it completely awkward and unnecessary for him to die because for someone to be "able to adapt for survival," he should have been able to survive the death scene instead of just blowing up. I think it was used in part of the producers to include a mutant death and make it ironic for the one who can survive anything to die. The other thing I found weird was how quick the humans wanted to turn on the humans even after they offered to help save the world. I can attribute this to the same so I'm alright with this but the civil politics and prejudices are something that have been highlighted in the X-Men; even more-so in this prequel. I think this has to be the highest score I've ever given in a review I've written on this site and it's well deserved. The acting was great, the cinematics and action kept me on the edge of my seat, the characters were well chosen (for the most part) and it left me wanting a sequel because it felt unfinished and so much more could happen in the next movie. For those of you who loves the X-Men history then you will not be disappointed in the film and for those new viewers, it's a good film to start the series and later learn the real story and other characters in the X-Men universe. I do recommend, however, to learn a bit about X-Men or else you will be lost and will not understand the relationships with the characters or what the basis of the story is even about. Agree or Disagree with the review? Share your thoughts below and let us all know what you thought about the movie!